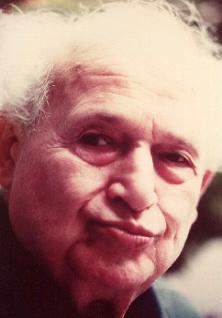 Moshé Feldenkrais, DSc, was a distinguished scientist and engineer whose career included work at the Curie Institute in the 1930s. He earned his DSc in physics from the Sorbonne, was a black belt Judo master, and went on to develop The Feldenkrais Method which is now practiced all over the world. Speaking about belief systems and the reorganization of the nervous system, Moshe described a seventy year old man who came to him whose mother had told him for seventy years to “stand up straight” and for seventy years he couldn’t do it, because his belief system didn’t allow him to listen to his own experience of himself. Moshe spoke of the millions of people who believed that the earth was flat and they could drop off it, until Columbus “followed his own nose” and discovered America. A young woman named Sarah Rosinsky who had cerebral palsy came to Moshe in 1976. Sarah was in my class in the second Feldenkrais Training of 250 students which took place for ten weeks every summer at Hampshire College in Amherst, Massachusetts and which was completed one year before he died in 1984. Sarah had at that time had her second child and had come to me for Ericksonian hypnotic work to help her with her anxiety and shyness about speaking on cerebral palsy to large groups of people. A woman of quick intelligence and marvelous insight, Sarah, now a Feldenkrais practitioner in California, feels that she is uniquely qualified to help others. November 1st, 2012: In order to run this in my website, I telephoned Sarah to find out how she is. Her daughters are grown, one is a Feldenkrais practitioner and the other, I believe, is an engineer. She is married and continues her work as a Feldenkrais practitioner.